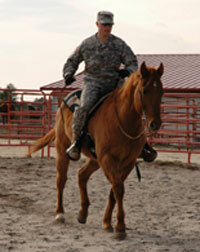 Original Article: Although the glory days of the United States Cavalry are long gone, horses still serve the military. At Smith Lake Stables, adjacent to Fort Bragg, N.C., 36 horses are owned by the U.S. government and serve their country in two assignments. In one assignment, they act as equine ambassadors, linking the civilian public to the military. The horses are used in an annual summer camp program and in weekly day camp activities for home-schooled kids. But the horses’ most important role is their real job. They help prepare active duty personnel, particularly Army Special Forces troops, for challenges in foreign countries. The rocky terrain found in remote areas of Afghanistan isn’t easy to traverse, even by jeep. Native horses become a mode of transportation. Pack animals, especially donkeys, also become familiar partners. For some of America’s elite troops, however, knowledge of horses and their four-legged relatives isn’t familiar territory. The first time they actually halter a horse, saddle it and ride it may be at Smith Lake Stables. But there’s more to it than just learning about tacking up and riding a horse, Rossignol says. The troops also learn herd management and how to treat common equine health issues affecting equines. That’s one side of the Special Forces that isn’t often seen by the Americans at home. In order to establish a good rapport with an agrarian or nomadic society, a Special Forces member might offer to help care for sick or injured animals owned by local peoples. It’s all part of spreading goodwill. Yet despite the benefits of maintaining a select group of horses for military training, the horses associated with Fort Bragg have faced some budget cuts. Land originally used for pasture was deemed too valuable for grazing, and horses were moved from the actual military base to their current home at Smith Lake Stables, a few miles away. “Yes, that land on Fort Bragg proper was deemed prime real estate. It’s now home for the 3rd Brigade of the 18th Airborne,” Rossignol admits. Nonetheless, the horses doing duty for Fort Bragg continue in their roles, serving their country in a vital way, much like their cavalry predecessors. They may be the unsung heroes of today’s U.S. Army. I think this article is really cool!! My dad is in the military and I go to the weekly day horse camp!!!! The Ft. Bragg stables are really neat. Thank you for sending me this article. Great article! Both my interests combined! I actually take lessons at Fort Bragg Stables. The horses there are great! A couple years ago a horse was nominated for an AQHA award for assisting wounded soldiers through therapeutic riding. These stables are a joke. Seriously-the care of the horses are the least priortiy, the management and workers do not take customer safetly very seriously, and the instructors currently have NO credibility. If a dead broke horse is one that rears and bucks or bites at others, then they need to reconsider. I am active duty Navy and am trying to find out more information on how I can become part of an equine unit in the military. My brother is stationed at Fort Bragg (at this time he’s Afghanistan) and he was telling me how for part of his training he had to go to a horse stable and learn basic horse care. This article was so neat because I got to get a look at what some of that training was like. Thanks for the article! How can we save this stable, and preserve this educational site and recreational aspect for our children ? If they ran this stable a little different I am sure there could be a chance of holding it without a lot of cost to the government … OPEN it at HOURs so ALL children and adults interested can come and rent a horse, not just 9 – 5 e. g. and get a riding trainer to teach the kids hand in hand with CYS ! They did afterall serve their country !!! kind of funny how now that they want to close the stables the trails are regarded as dangerous or unsafe for riding but for the last 6 months it was ok for the special events i.e. EDGE and GI Jane and others were out on theses same trails as well as private owners and outsiders that have an annual pass for the trails. This was not an issue if it was to make money for another facility. As far as the fiscal discrepancies you tell me a facility that has a daily overhead that has been closed for six months out of the year that will make money. They won’t! As for the question as to whether or not there was insurance of course there is. You don’t have a facility like that without insurance. Who are they trying to fool? My papaw said it best when he said don’t pee on me and tell me it’s raining. As far as pasture conditions MWR was ok with moving the stables to a location with no established pasture. As for the construction being a danger to the horses, i believe the only buildings on site when the horses arrived were the barns. The hay shed, tack line, and office were all built after the move. Was there no danger when putting in the geo thermal heat and air for the office? I guess 15 foot trenches beside the pasture were no big deal huh. I guess what bothers me most of all is MWR’s attitude about making money. I thought it stood for Moral Welfare and Recreation for our military and families not making a buck. I think it’s time to take a step back and think about what their true purpose is. As I’m shur this will be deleted from this page due to the negativity towards an unjust act, I will be posting this as many places as i can, not just here. thanks for the articile,but what breed of horses do you use,how old are the horses when you get them.What is the requirement to be in the special operations force.Do you have a breeding farm there on base? How much training do the soliders receive prior to being sent out with their horse. This makes me wish I lived close enough to volunteer. It would make me feel like my degree in Equine Management and my experience with horses over the years were being put to good use again. What an amazing story. I never knew about this great program. We have to help keep it up and running. Our soldiers need this experience especially if we are fighting in the Middle East. Everyone share and spread the word. To sugest that the militery has fewer horses and bayonets was a very petty remark. We do have fewer horses ect. But in the same turn we do have less ships. One ship can only be in one place at a time, our missel defence has been dismantled to a point of jepordising our national security as well. My dad served in WWII. He was over the horses that pulledd the big guns in Germany. (The calvary) He was a Master Sergeant. He really has some great pictures. They used really big horses, not draft horses. i worked at the fort bragg riding stables back in 1973/4. eighty horses, half were owned by the army. the only training mission I saw was a travesty; military snafu. nose to tail trail nags; they knew a greenhorn when they saw one. only 4 or 5 were worth riding, and we did, those midnight jaunts weren’t authorized. the other horses belonged to the generals wives and the officers 14 year old daughters. sarge hagmeyer was the real deal. a shoutout to bruce, dallas, and fred. ps yeah I was sad when I saw the new barracks on the ‘prime real estate’.